Traveling can be a lot of sitting, so that when we get to a destination, we're ready to get up and get out! National Parks, friendly campsites, and rallies, all beckon RVers to travel and enjoy more of the natural beauty of our country. But, wherever the evening stop, at the end of the day, a comfortable chair makes the "ah!" moment of the stop. It's the place to review plans, maybe what transpired during the day, or watch the news. Comfort draws out conversation. Repose can bring relaxation only if the chairs are comfortable. 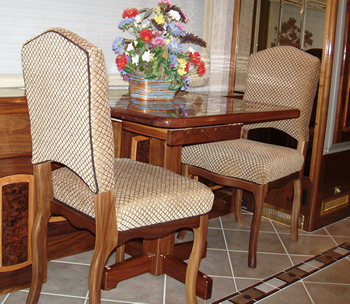 Satisfied customers say that RV Outfitters have customized their seating by reupholstering in leather or other fabrics to match their décor when they renovated and added new seating. Is there a fight over who sits where? Who would say that one size chair fits all? When the seat is too deep, or too short in the back, all the squirming, scooting, and leg propping won’t make for a comfortable fit. To ensure a proper fit, measure just as if a garment is going to be tailored. With a yardstick and the partner seated on a firm seat, measure the individual’s back frame. Note the distance from the curve of the back of the head to the seat, and use this for the measurement for the seat back. Next, place the yardstick down on the seat beside the partner to measure from the back of the chair to the back of the knees. This will indicate how deep the seat must be to sit comfortably and not have circulation cut off by a cushion that is too deep for the length of the hip and thigh. Last, using the yardstick, measure from the back of the knee to the soles of the individual’s feet. If the chair does not fit in this last measurement, the person will have to sit forward with no back support or curve the spine to rest the shoulders and still have their feet rest on the floor! My husband and I went through two recliners trying to get comfortable. Analyzing the problem, I realized that though we weren’t many inches apart in height, our builds made twin recliners impossible. For example, when we sit on a sofa or bench, my shoulders are slightly higher than his so that I can put my arm on top of his shoulders very comfortably. When we stand, his long legs make him more than several inches taller than me. When I picked out chairs, if they were deep enough in the seat, his feet touched the ground, but mine were several inches off the floor, and if my back was comfortable, it hit him too high. Having him pick out a comfortable chair took several trips and sitting in dozens of chairs to find the best combination for a perfect fit to his body. Hubby found quickly that he preferred leather to any of the fabrics. It breathes in warm climates making it cool, while it warms in cooler climates. It allows the fabric of clothing to slide as the sitter adjusts, shifts, or stretches to relax. While I am comfortable in the rocker chair I moved to our RV, I’m having RV Outfitters upholster it in leather to match the interior of our RV. I’m sold on the comfort of soft leather, but like more padding than a recliner offered. This chair is a fit that keeps me from having to push myself out with my arms when my feet can’t rest on the floor! Customer Testimonial"They are both friendly and trustworthy. They are always ready to do anything you need to have done and will work around your time schedule."